A deadly air-war between Iran and Israel erupted shortly after President Donald Trump withdrew from the landmark 2015 nuclear agreement. 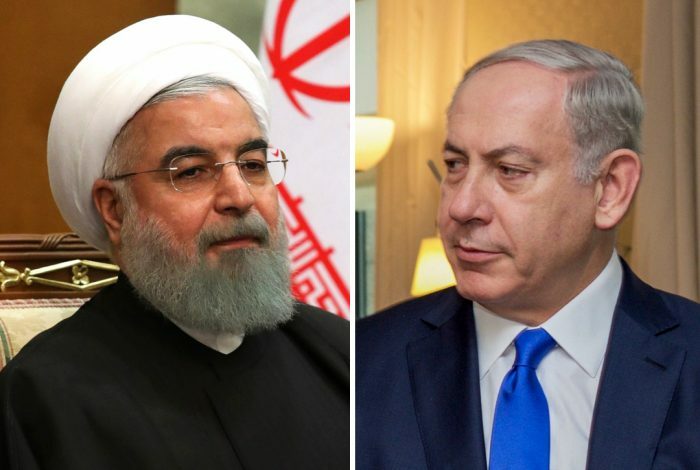 Driven by the expanding presence of Hezbollah — the powerful Iran-backed militia — in Syria, tensions between Iran and Israel have been simmering since the beginning of the year, with both sides trading accusations of espionage and attacks on each other’s military bases. In February, Israel accused Iran of downing one of its jets — the first to fall in combat in more than three decades — before killing at least 13 Iranian nationals in a retaliation strike. But neither has yet unleashed a full-blown military operation. Just one hour after Trump pulled out of the nuclear agreement, Israel reportedly fired a missile near the Syrian capital of Damascus, killing 15 — at least eight of them Iranians. The next day, Iranian troops fired 20 rockets into the Israeli-controlled area of Golan Heights. Four were intercepted by Israel’s anti-missile defense system, while the rest fell short of their target, according to an Israeli military spokesman. Iranian media, on the other hand, claimed that Syrian forces orchestrated the attack. The response, coming just hours later, was thunderous: Israeli warplanes struck critical Iranian bases in Syria overnight, killing at least 23 people. Israeli Defense Minister Avigdor Lieberman said that the counterattack decimated Iran’s entire military infrastructure in Syria. Its targets included intelligence sites, weapons storage facilities, a logistics headquarters of the Islamic Revolutionary Guards Corps, and military compounds. Trump, building on his pro-Israel stance, immediately condemned Iran for making the first strike. But, as mentioned above, some reports indicate it was actually Israel that struck first. While relations between the two nations have been cold for a long time, the escalation of military action links directly back to the US. Trump’s decision to withdraw from the nuclear agreement emboldened Israel to confront Iran’s growing intervention in Syria. Saudi Arabia, the other major power in the Middle East, said that it is prepared to develop nuclear weapons should Iran restart its program. As for Iran, desperation could fuel a desire for retribution: the Iranian rial has dropped perilously against the US dollar, and will likely keep dropping in the coming months. Without a diplomatic solution, widening military confrontation, to many experts, seems imminent. Watch the videos below to learn more about the Israeli-Iranian conflict in Syria. Related front page panorama photo credit: Adapted by WhoWhatWhy from vice (valeriy osipov / Flickr – CC BY 2.0).